Habit: Annual, glabrous to hairy. Stem: generally branched. Leaf: alternate, deeply pinnately lobed to 1--2-compound; stipules 0. Inflorescence: flowers solitary in axils, pedicelled. 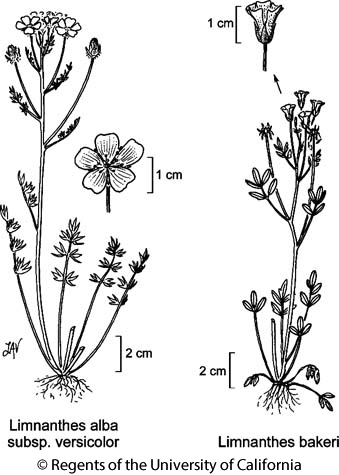 Flower: generally bisexual, radial; sepals 3--5, free; petals 3--5, free, white to pink or yellow; stamens 3, 8, or 10, free, generally in 2 whorls; nectary glands at bases of outer stamens; pistil 1, ovary deeply 2--5-lobed, style 1, from base of ovary. Fruit: mericarps 1--5, 1-seeded, ovoid to spheric, generally tubercled. Chromosomes: 2n=10. Genera In Family: 2 genera, 10 species: temperate North America. Scientific Editor: Douglas H. Goldman, Bruce G. Baldwin. Habit: Annual, decumbent to erect. Leaf: generally 1-odd-pinnately lobed or compound; lobes or leaflets entire to deeply lobed. Flower: sepals (4)5; petals (4)5, generally > sepals, tips toothed or jagged; stamens 8 or 10; ovary lobes 4--5. Fruit: mericarps 1--5, 2.5--4 mm, obovoid to nearly spheric, smooth, ridged, or tubercled. Species In Genus: 7 species: +- coastal western North America. Etymology: (Greek: marsh flower, from habitat) Note: Plants reported as Limnanthes macounii from CCo are variants of Limnanthes douglasii (Meyers et al. 2010 Syst Bot 35:552--558). Habit: Erect, herbage glabrous to hairy. Stem: 8--40 cm. Leaf: 2--10 cm; leaflets 5--11, linear to ovate or oblong, entire to deeply 3-lobed. Flower: bowl- to bell-shaped; sepals 4--8 mm; petals 8--15 mm, curving over fruit in age, white to cream, aging pink or violet, base occasionally +- yellow; filaments 2--6 mm, anthers 0.75--2 mm; style 3--6 mm. Fruit: mericarps smooth, wrinkled, wide-ridged, or sharply tubercled. Habit: Herbage glabrous. Flower: sepals glabrous to sparsely hairy; petals 12--15 mm, cream, tips recurved, drying lilac; anthers +- 1 mm, cream or +- pink. Fruit: 3.5 mm, smooth or sharply tubercled. Citation for this treatment: Robert Ornduff & Nancy R. Morin 2012, Limnanthes alba subsp. versicolor, in Jepson Flora Project (eds.) Jepson eFlora, http://ucjeps.berkeley.edu/eflora/eflora_display.php?tid=51258, accessed on April 20, 2019. Citation for the whole project: Jepson Flora Project (eds.) 2019, Jepson eFlora, http://ucjeps.berkeley.edu/eflora/, accessed on April 20, 2019. KR, CaRF, n&c SN. Markers link to CCH specimen records. Yellow markers indicate records that may provide evidence for eFlora range revision or may have georeferencing or identification issues. Purple markers indicate specimens collected from a garden, greenhouse, or other non-wild location. (Note: any qualifiers in the taxon distribution description, such as 'northern', 'southern', 'adjacent' etc., are not reflected in the map above, and in some cases indication of a taxon in a subdivision is based on a single collection or author-verified occurence). View elevation by latitude chart Data provided by the participants of the Consortium of California Herbaria. Duplicates counted once; synonyms included. Species do not include records of infraspecific taxa, if there are more than 1 infraspecific taxon in CA. Blue line denotes eFlora flowering time. We encourage links to these pages, but the content may not be downloaded for reposting, repackaging, redistributing, or sale in any form, without written permission from The Jepson Herbarium.